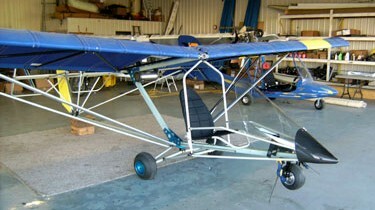 The FreeBird 103 was computer designed to make a legal 254lb ultralight with 3 axis control, steerable nose wheel, and the Black Max hydraulic brake system. Using the same basic wing design used on the LS-Ultra, the fuselage was totally redesigned to shave weight without compromising integrity. Designed by Sherman Hawley, the wings fold for storage in a one bay garage, and the craft can be towed by car, and wing unfolded in ten minutes.